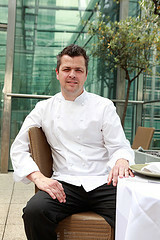 A few months back, Allan Pickett became Head Chef at Canary Wharf mainstay Plateau. With a challenge to create dishes that rival or exceed the quality of this restaurant and bar's lovely fourth floor views (especially nice at the moment with the ice rink below), Allan's set with the task of livening the menu up and keeping his well heeled punters happy. It'd been awhile since we ventured to the Wharf for a visit at Plateau and we were pleased with what we sampled from Allan's kitchen. Equally pleasing was getting to chat with the affable and down to earth – but no less enthusiastic – chef. Here are the highlights of our interview. You've worked with an impressive line up of chefs and at a delicious variety of restaurants. Care to share some of the highlights of your background with us? I have been lucky to have worked in some of Britain’s top kitchens, a couple of them for very short times, but I learnt an amazing amount from the chefs there. I only worked at Le Gavroche for about six months with Michel Roux before moving on. But wow, the kitchen is a well oiled machine. The produce that comes in is first class. I’m sure it's the toughest kitchen to work in at the moment. I've also worked with some great chefs. I have to say two people have had a massive effect of my cooking. Firstly an old head chef of mine called Roger Naylor, who had worked at Le Gavroche for three years back in the day of Stephen Docherty. He would always regale me with stories of his time there. Because of his links with Le Gavroche and the company I was working for at the time (was Roux restaurants, now Roux Fine Dining) I was able to do a couple of nights at the restaurant which Roger sorted out for me. Just amazing. Being able to see the workings of a two Michelin star restaurant for a night was great. You feel a right plum, but you just get in there and muck in, help wash up, do anything to help the chefs. Immerse yourself into the atmosphere and just try and take everything on board. I thought my kitchen French was good until I worked there full time. Like all good kitchens you are expected to listen to everything during the service. If you don’t then you will soon enough. The other chef who had guided me through my career is Chris Galvin. What a man. He was a father figure to me when I really needed it. I was introduced by a good friend called Mark Stone. An opportunity came up for me to work at the new Conran restaurant Orrery in Marylebone High street where Chris was head chef. Bloody hell it was hard work. Starting work at 6.45am some mornings to just to be ready for lunch and then finishing late. Little things like having windows in the kitchen make such a difference, seeing the sunrise and set. Watching the leaves fall from the trees in the winter etc etc. These are the things you don’t normally see from a kitchen window. I loved working there as I was always learning so much. Chris taught me how to actually make a healthy GP% on a monthly basis. I still use a similar costings sheet to this day as we used to use at Orrery. Some things never change. The other thing that he taught me was never to compromise on your standards. If it wasn’t good enough to serve he wouldn’t send it out. The customer would wait but would then get a dish he was happy with. Some of London’s best chefs have been through the Orrery kitchen. Chris had a real understanding of how to simplify a dish to the very basics, but it would still taste amazing and look the part as well. He showed great respect to all his chefs. Work hard, play hard was a motto used by the younger lads. I loved to do competitions back then, and Chris was always pushing me to do different ones all the time. I was lucky (or unlucky depends on how you see it) to come runner up twice in the Roux Scholarship. What got you into cooking for a living in the first place? Well it was a choice between being a landscape gardener or going to college and being a chef. Cheffing won over as I hate being cold. There’s nothing better than walking into a warm kitchen on a frosty morning. Absolute bliss. I always cooked with my nanny Freda a lot when I was little. So really enjoyed that. Also I was lucky to be able to see my grandparents every week it felt like and I have lots of fond memories of them and being around food. Some of it not very healthy but who was to know? My granddad (pop as we used to call him) used to grow lots of his own vegetables, he had an old coal bunker which was normally full of potatoes, which he would have us digging out every time we were there. From the potatoes he would make his own chips for us to eat with corned beef and his own pickled onions (yuck). I can taste it all now. I just hope my children grow up having similar happy memories about food as I do. You've been head chef at the few years old Plateau since May. What's it like taking the helm at an existing restaurant? What did you want to change about the place and what did you want to retain? Well I've always said there were not many propertys/restaurants that I would come back into London for. Plateau was always up there at the top of my list. It helps that it is owned by D&D, who I have worked for before. David and Des are great people to work for, and I have some really great GM’s around me at the moment. So I can continue to learn about the financial side of the business more. Taking over from another chef is always interesting as you have so many hurdles to overcome. The biggest one is staffing, who will stay and who will go. I was very lucky that Tim Tolley wasn’t moving on to a new venture immediately so not many of the chefs left. I could always see the massive potential with Plateau, but like with all restaurants you have to constantly evolve the offer. If your menu never changes then the customers will go where the menu does change. Our restaurant menu changes at least one a day whether it be a complete du jour dish or something like a mushroom has ended its season and we start using a new one. I would just like to attain another rosette taking us up to three Rosettes if possible, which is the standard I’m used to cooking at. The only thing I wanted to retain was the view of Canary wharf which is amazing. I hope I have made my mark already. Change is good for everyone, which means not taking my eye off the ball. I’m lucky I have a great family life with three amazing little boys and a wife (Chloe) who is very supportive of everything i do. Plateau's definitely a mainstay of the Canary Wharf dining scene. Worth a visit if you don't work or live there? Worth a visit if you don't work or live there? I like to think so. I can only hope we exceed peoples expectations. We will keep pushing on all the time. What's your favourite thing about the menu at Plateau? Being able to enjoy the food I am cooking again and seeing the food go out consistently makes me happy. Any tips on how our readers can make the most of the London dining scene? Go and eat out at lunch. Most good restaurants have a du jour menu, which tends to be a real bargain. Chefs want their restaurants to be full at lunch as well as dinner. Hunt out the restaurants that will allow you to take your own wine. I remember asking a local hotel if we could bring our own Champagne for the celebratory dinner we were having there and they said yes but were going to charge me £45 per bottle for corkage. You're not going to make any friends that way. I will never go back. Plateau is located on the fourth floor at Canada Place, Canary Wharf, E14 5ER. Visit the restaurant online at www.plateau-restaurant.co.uk.